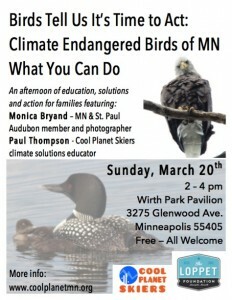 Join Cool Planet Skiers and the Loppet Foundation with special guest Monica Bryand for an afternoon of education, solutions and action on climate change for families. Nearly half of all bird species in North America are seriously threatened by climate change and in Minnesota we have 166 climate threatened or climate endangered species. In Minnesota climate endangered birds include the Trumpeter Swan as well as American White Pelican, Common Loon, Mallard Duck, Bald Eagle and many others. Winter in Minnesota is also threatened by climate change, so the ski community is the perfect place for conversations and action on climate solutions. Cool Planet Skiers do just that. Our afternoon will feature stories, photos and how you can be part of the solution. We will focus on practical actions that families can take together. Paul Thompson is a founder and Co-Director of Cool Planet. He is an avid cross-country skier who has completed 36 American Birkebeiner cross-country ski marathons. Through Cool Planet, Paul advocates for climate solutions. As a retired 2nd Grade teacher, Paul enjoys working with youth and adults to take action as global citizens. Share the flyer, handout and Facebook event with others.